Language is Influence: What Kind of a Teacher are You? 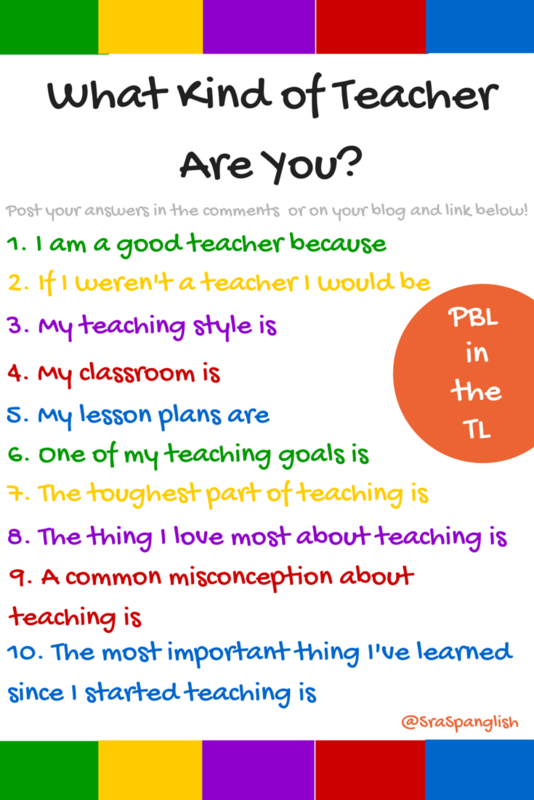 I loved this challenge to reflect posted by Laura Sexton on her blog. I wanted to define my teaching styles and influences in a concrete way, and I thought this was a great way to do so. I am a good teacher because: I am a good learner. I am curious. I hate to be stagnant. I revise, reflect and revise again. If I weren't a teacher I would be: A full time student. Probably getting my master's at a university abroad and never wanting to come back. My teaching style is: Relationship-oriented. My classroom management, my report, everything is centered on how well I get to know my students and how much they trust me. My classroom is: MESSY. Blue walls, travel maps and pictures, papel picado, magnet manipulatives, student work, library books and magazine...learning is messy. And I'm unorganized. My lesson plans are: In an adorable polka dot planner. I write/plan in that over the weekends and then I transfer them to a large calendar at the front of my room and a day-by-day agenda on the marker board. Each night, I also update my Teacher Webpage. One of my teaching goals is: To grow our program to reach our elementary schools. I want to show and convince our community how vital language learning is even BEFORE kindergarten, but especially in the primary years. I hope I get to see the program trickle down to all grade levels. The toughest part of teaching is: imposing things on students that I do not personally agree with. When I know something negatively affects them or their learning of Spanish, it is hard for me to put any amount of effort into it. I know there will always be things that we must do simply because we must do them, but for me rationale behind the duty is everything. If it is not there, I can rarely fake it. The thing I love most about teaching is: character development. Helping students to become better people, not just better language learners. A common misconception about teaching is: that one should teach the way that one was taught. Times are changing. Students are changing. We must change, or become irrelevant. The most important thing I've learned since I started teaching is: I know much less Spanish than I thought I did. I have not "arrived." I am not "accomplished." I continually have a long way to go, I just happen to be helping others come with me. I would LOVE to hear your answers. Share them with us! Great job, Alison! You are such a special teacher. You ROCK!!! Thanks so much for reading through this, Sandy! You have been such a good example to me through IMAP meetings and mentoring. I would love to read your answers if you do it.